Good afternoon, Agents and Investigators! 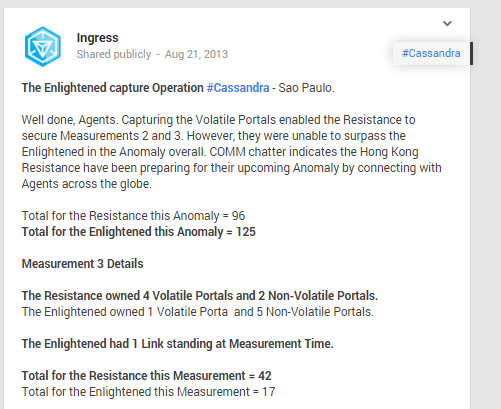 My name is Mustafa Said and welcome back to the Niantic History coverage of the Cassandra Anomalies. 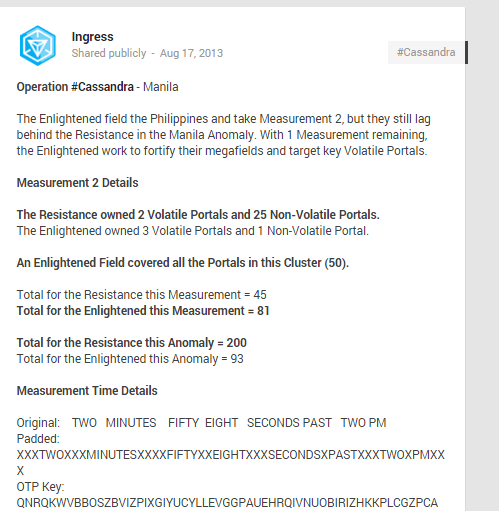 So let’s begin with the Anomalies that struck Manila, The Philippines on August 18th, 2013. 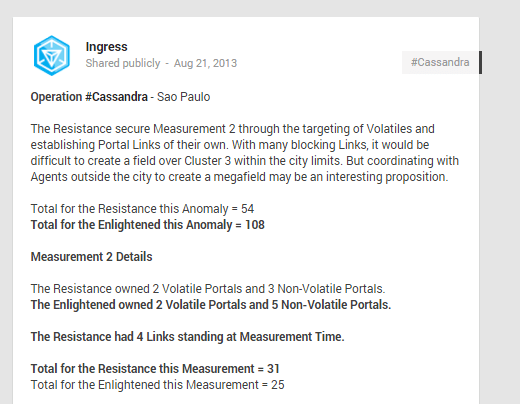 When you discovered that your area was getting an anomaly, how did your faction plan for it? ArginusPrime: We created a temporary community where the plans were discussed and updates were posted. We planned for both the movements of the ground agents in the Clusters (which we further divided into Sectors) and the mega field to enclose the Clusters too. Whizzard: The plan was that we could field within the clusters prior to the checkpoint, bring up the huge field over the entire area, then use a Jarvis virus to take it down so our field agents could field within clusters again, rinse and repeat. jeprox: We chilled….drank beer most of the time. Sparkrush: We had the right keys at the right time. And countless farming nights followed by strategy-planning and beer. Stryderr: Month-long farming and weekly meetings. Eugene: Strategies discussed online then face to face meetings. Parking locations were also important. TheUnicorn: All agents gathered every night each week and farmed, farmed, farmed. cydoki: We sent out a notice through our community at G+ looking for volunteers and requested Area Leads, to spread the news through their Hangout. Good thing we got a lot of volunteers, so agent wise it wasn’t a problem. And also, farm, farm, farm. Everyday, every time we thought of farming we got out and built farms. paraluman: Bagnet (a local delicacy). Beer. French fries. Beer. And sleepless nights of farming. At what point did you feel like the ENL could gain the upper hand? 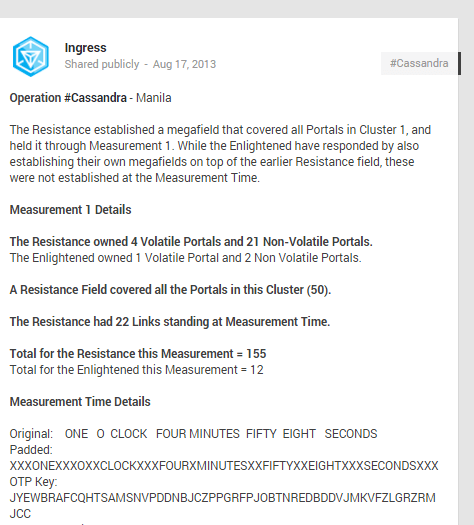 ArginusPrime: When the Resistance mega field was taken down minutes after the first checkpoint and replaced with a bigger Enlightened control field. I was in the Batangas vertex of the mega field and was recharging my phone inside the tourism office building when the field went down and it started to rain heavily. I was like: “I have a bad feeling about this”. Headed back to Manila through the storm when the team has confirmed that we do not have Agents to mobilize to neutralize the Enlightened mega field. Whizzard: The Enlightened mega field put that plan into a screeching halt. jeprox: About 60% of the time…all the time…..
Stryderr: Initially, the field we made blocked their plans so they had to do something about it. But we were more determined and organized. Sparkrush: I was assigned to create a covering field over area. Relaxed a bit when that went up but then got destroyed in the 1st 5 minutes of the hour and the suddenly the green field went up. Fortunately, our field was counted for the 1st measurement so that gave us an edge already. Eugene: Personally felt we already had a solid hold on the anomaly. TheUnicorn: When they destroyed our megafield. 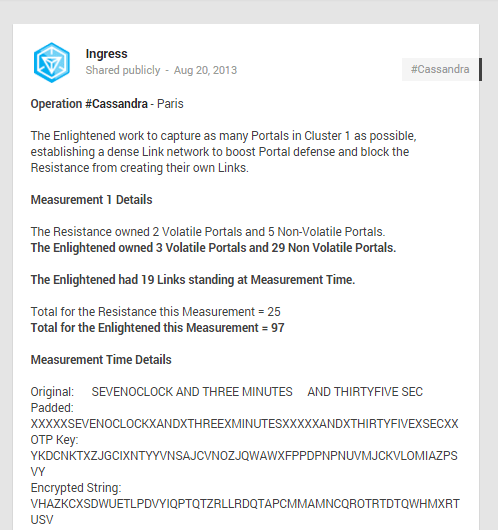 But we were concentrated on the portal clusters to even worry about that. We had more than enough ground agents to give the faction leverage. cydoki: When the green megafield went up, we were thinking, that’s 50 points right there. But looking at the number of ground agents they had at the site at that time, we just focused on getting all the volatiles and capturing as many of the portals we can. We had more ground agents anyway. paraluman: Existence of spoofers.. but I strongly believed in the intelligence of the masterminds of our faction. I didn’t have the slightest doubt about what factionmates can do to win the anomaly. Our awesomeness were very evident from planning to execution. What are your overall thoughts that you took away from the anomaly? 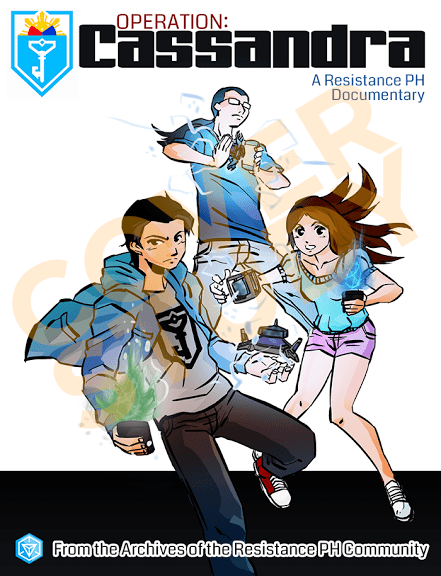 ArginusPrime:Bring as many power banks as you can when traveling outside Manila. You’re bringing 10? Bring some more! The low reception signal puts stress on the phone to use more battery power. Stryderr: Heart, dedication and irreplaceable memories. I guess the most important thing is that you always have fun and believe in your teammates. That helps you overcome any obstacle. Sparkrush: Clear comm lines and an easy-to-execute strategy are essential for smooth transition between combat stances. TheUnicorn: We were in the middle of a storm that day but everyone showed up. I think it was the bond of friendship, cooperation, support and most of all, preparation that made a big difference. cydoki: I was happy. Never before did so many resistance agents gather in one place. And it was a lot of fun, running all over the place capturing portals left and right. What do you think Cassandra was about? 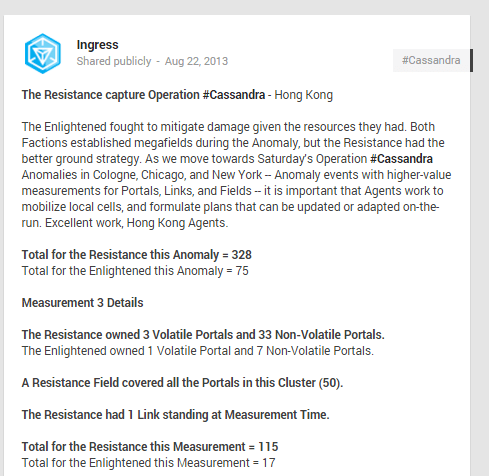 ArginusPrime:Operation Cassandra was an attempt to save Cassandra from certain death. She still died in the end though. 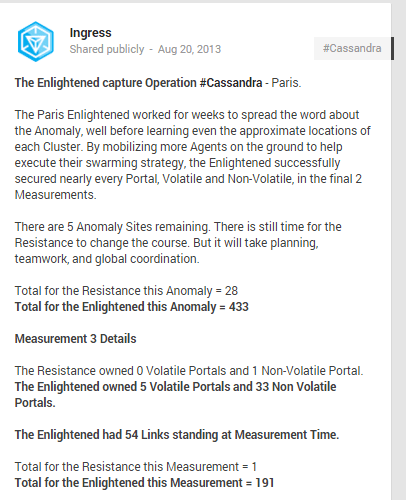 X( At its time, it was the biggest Ingress event too where an XM Anomaly was done on a global scale so it’s also about getting the whole world collaborate to achieve an objective. Whizzard: I actually have no idea. Who is this Cassandra person anyway? jeprox: No idea. Who was Cassandra? Stryderr: I dont know who or what Cassandra is all about. TheUnicorn: There was a Cassandra character in the storyline but it was a very minor role. 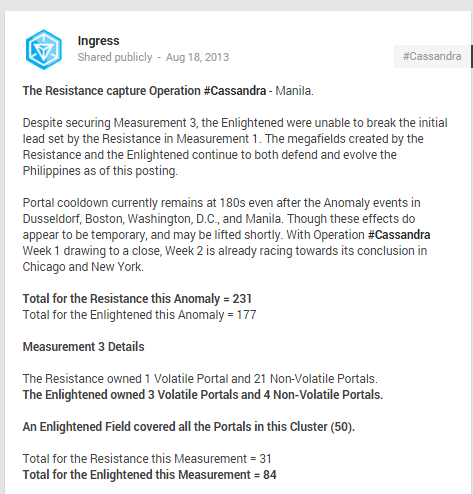 Then the objective of controlling global power centers, I think, was one of the ways for which Niantic would be able to see and study the impact of global anomaly participation (this was the first anomaly here in Manila). Hilda: We started out gathering troops and intelligence. From there, we pictured all sorts of scenarios and formulated our overall strategy. Mustafa: My second is, At what point did you feel like the ENL could gain the upper hand? 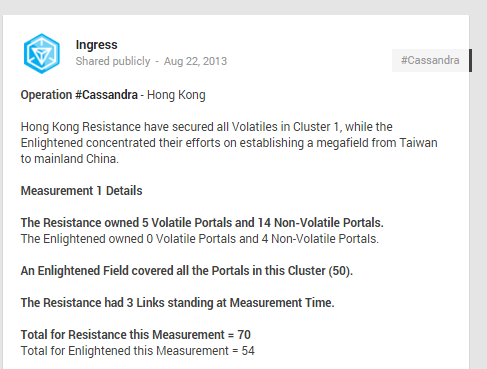 Hilda: I was on the ground when an EN CF covered the entire Hong Kong during measurement 1. All I could tell my team was to focus on the portals within our reach and do our part. Hilda: To the storyline it was probably just a prelude. To me it was a test on how strong our community was — and we had what it takes to win: individual commitment, transparent leadership and thorough planning. To Niantic it was a fruitful capacity test — they successfully stressed out and broke the servers at measurement 2. Wyman: I remembered when we received that our city will be an anomaly site, we started to plan for it for the anomaly. Since the time we have is just a month, we have planned to have CF team which will create a CF covers the entire cluster, Intel team for monitoring the Intel map and also ground teams with different roles. Also, we have organized some pre-ops team which turn the portals inside the cluster blue before measurement. Although the time is so tight for us to plan and even we have meetings overnight, but it was fun and had a good result. Mustafa: Second question, At what point did you feel like the ENL could gain the upper hand? 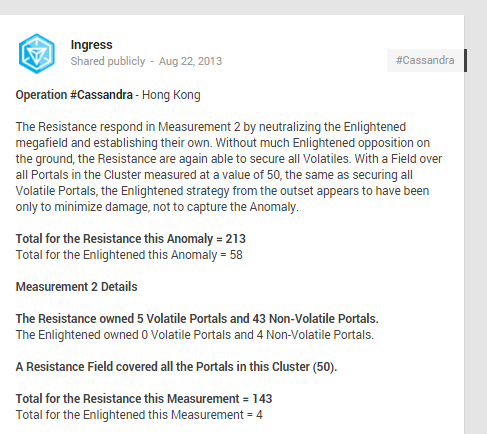 Wyman: At the first measurement, an ENL field has covered the entire cluster over Hong Kong, we are so worried about the field will last until the end of the anomaly because they contributed with other cities agent for the field. But luckily there were RES agents just next to the portal so we can clear it and even we link back a big blue field to cover back the whole cluster. Mustafa: Third question, What are your overall thoughts that you took away from the anomaly? Mustafa: Anomalies are focused on teamwork and participation. Anything that happens in the anomaly needs teamwork. For me, teamwork is the key leading us to win in game, and even in our career or study. Mustafa: Final question, what do you think Cassandra was about? Wyman: For me, Cassandra was about shaper glyphs, and XM. At that time, Shapers and Jarvis are discovered in portals and want to control the human using glyphs and it was dangerous for humans if the glyphs are in some sequence. For XM, although XM can somehow affect human beings but I think XM is not really that dangerous for us to discover XM and even using it in our daily life. 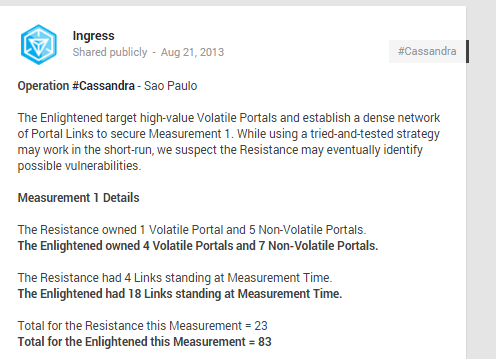 #Cassandra is about to end…. 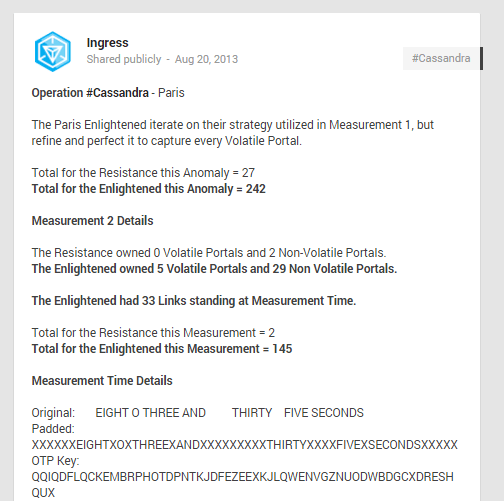 Tune into DeCode Ingress to find out what happened next in Niantic History!